Mornings can be quite hectic. Getting breakfast made, packing lunches and making sure homework is not forgotten are just a few of the many things that keep us on our toes in those early hours of the day. I am sure there are other families who can relate. It can be difficult to make a healthy breakfast when in such a hurry. 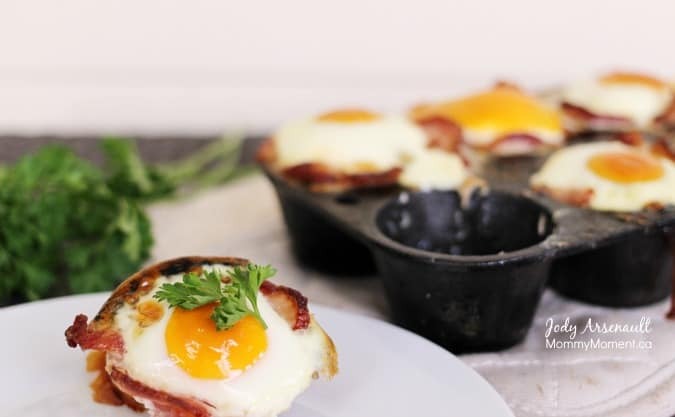 This recipe for bacon and egg muffin cups is super easy, is a hit with the kids, and doesn’t require much attention to make, allowing you to concentrate on getting the kids ready for the day…all the while ensuring they will have a complete, healthy breakfast. Bacon and Egg Muffin cups are a fun version of traditional bacon and eggs and the results are super easy to take anywhere. Cut your bacon in half so they are in strips approx 4 inches long. Take out your medium-sized muffin tins (we use cast iron muffin tins) and place the bacon in the cups. I find it works best to have the bacon strips placed in the cups in a “x” style with 2 strips per cup. Crack the egg and place the egg in the bacon-lined muffin cups. Put in the oven at 350 and bake ‘til desired doneness. This is a great healthy take on traditional bacon and eggs and the results are super easy to take anywhere. 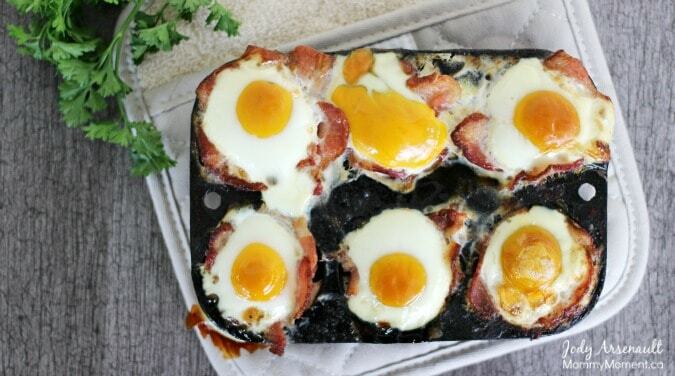 The bacon cooks to the form of the muffin tin and holds the egg nicely in place. Hubby has been known to take these on the road with him when he is on the go, and even the girls have been know the grab these and chow them down as they are trying to find last night’s homework or looking for their mittens before catching the bus. A true hit in our home and fun for kids. Make this a hit in your home too! « 35 Peppermint Drinks and Desserts! Who wouldn’t love a Bacon and Egg Muffin cup! What a tasty breakfast or mid morning snack! We love local egg farmers! They look great! Hubby makes something similar with a bacon bowl, I like that yours don’t call for that so there’s one less thing to wash.
Mmmmm, bacon! My entire family would love these. I will have to try them. So easy! These are great to make for breakfast for the whole family! That looks sooo good! My kids will have this any time of the day. These muffin cups look really good. This is a really easy breakfast to make on weekday mornings. These would make a perfect portable breakfast. Oh my! Breakfast in a cup! My hubby would love this! These look amazing. We’ve been trying to add more eggs into our diet as we can, so these would be perfect to get in! My kids would love them! I really want to dig into one of those egg yolks. That looks delicious! These bacon and egg muffin cups look delicious and easy to make. omg these look delicious! I have made these a couple times (it has been awhile since i last made them tho) but they did not look as good as yours! These look GREAT for a SUNDAY brunch! Thanks for sharing this recipe.. I really need to try these…..my guys would love them!!! This is my idea of a perfect breakfast! !